Cheese stuffed shells are good. 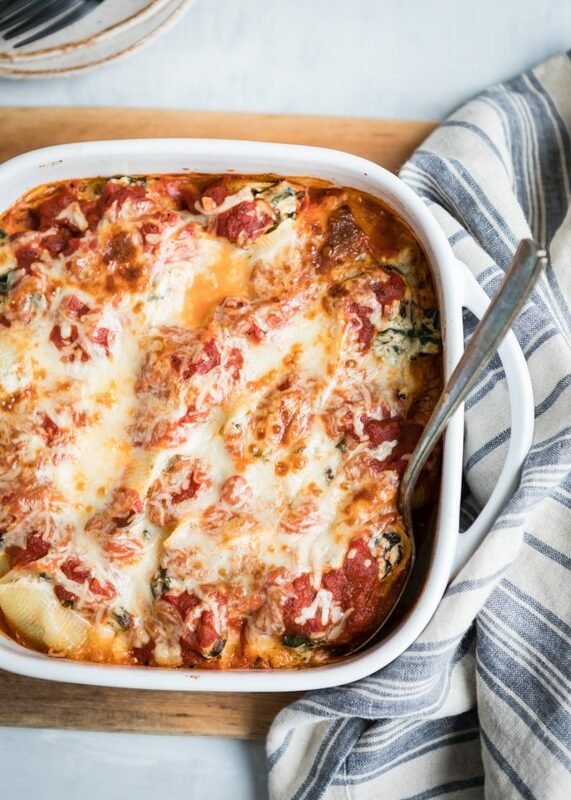 Spinach stuffed shells are better. But these Greens and Mushroom Stuffed Shells? They’re the best. The addition of veggies makes this recipe so much more flavorful than other versions–and it’s also more filling and nutrient-dense. Score! 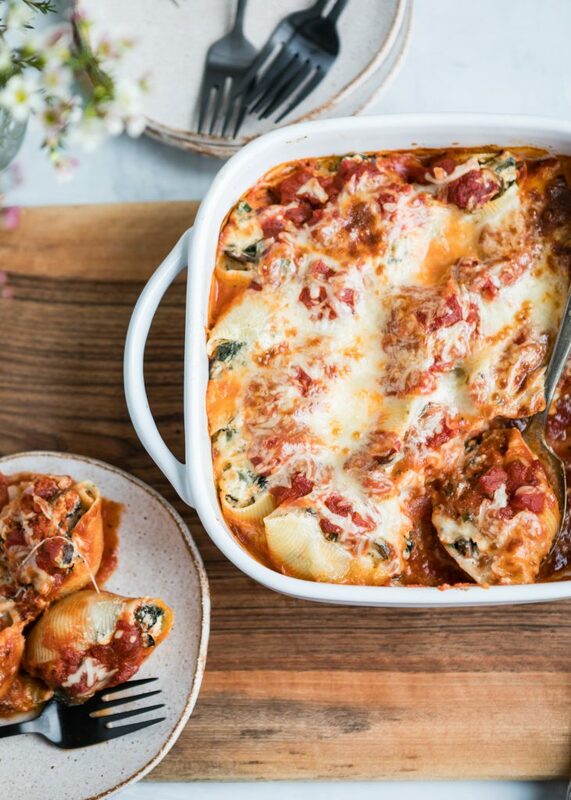 But what really makes this vegetarian stuffed shells recipe a winner is the fact that it’s also a make-ahead meal. 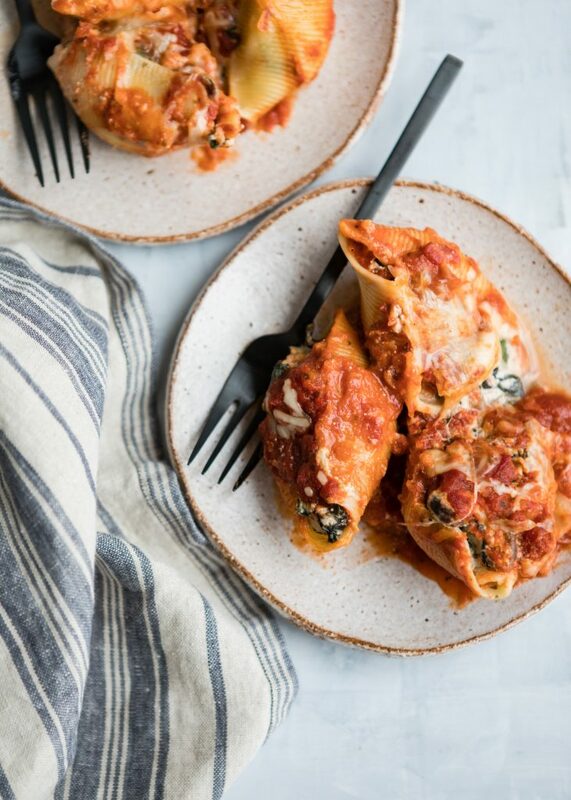 Since stuffed shells are a cinch to portion out, you can even freeze them in individual serving sizes for work lunches that are ready when you are. For the greens in these stuffed shells, I went with chard because it’s a little more substantive than spinach, but less bulky than kale–but really, either of those would work well in here too. I’ve tested this recipe both with and without the chard stems; I find the texture is better if they’re left out. But that doesn’t mean they have to go to waste! Thinly slice them and sauté them in a hot frying pan with garlic, olive oil, and a pinch of chili flakes if you like a kick. They make a nice little side dish for the stuffed shells or you can save them for another day–they’re good with pasta, polenta, socca, and even on a pizza. 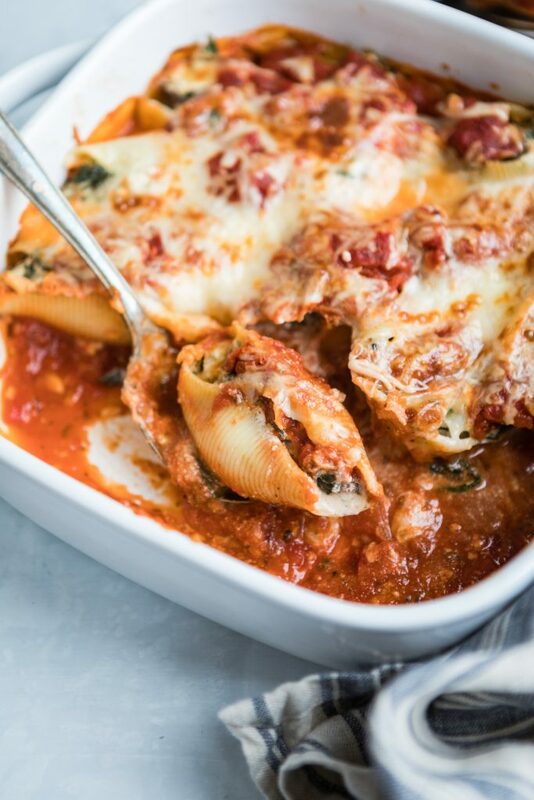 Greens and mushrooms make vegetarian stuffed shells much more flavorful--and healthy! Preheat oven to 350ºF. Lightly coat or spray a medium baking dish with oil. Heat the olive oil in a large skillet over medium-high heat. Add the garlic and mushrooms and cook for about 5 minutes, or until the mushrooms have released their juices and the liquid has evaporated. Add the chopped chard and heat until wilted, 1-2 minutes more. Remove from heat, drain off any liquid (this is important! ), and season to taste with salt and pepper. Transfer the mushrooms and greens to a large bowl. Stir in the ricotta, Parmesan, and Italian seasoning. Taste the filling and add more salt and pepper if needed, then stir in the egg. Spread 3/4 cup of marinara sauce on the bottom of the baking dish. Fill the cooked shells with the ricotta-vegetable mixture and place them in the baking dish. When all the shells are stuffed, spoon the remaining marinara sauce over the top, then sprinkle evenly with the mozzarella cheese. Cover the baking dish with foil and bake for 30 minutes; remove the foil and bake for 15 minutes more, or until the mozzarella has melted and the sauce is bubbling. Let the shells cool for 5 minutes, then serve.